When you are happy at work you’re more likely to be eager to learn, creative, self-confident, productive and effective. What is more, during periods of changes or stress you’ll be better able to adapt and respond creatively. Happiness at Work doesn’t just make your work place more enjoyable, it will also have a beneficial effect on your colleagues and your company. 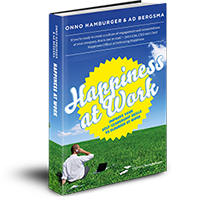 This book by Onno Hamburger and Ad Bergsma presents a step-by-step method to create more happiness and fulfilment using the Happiness Compass method. The authors show which factors impact on whether someone flourishes at work and you can also test yourself to see where you stand in relation to your own Happiness at work and identify opportunities to grow. Practical exercises are given to train yourself to realize your wishes and dreams. Now you can be more effective in your current work or take your sharpened ideas with you to your next project. Happiness at Work is evidence based, realistic and written with enthusiasm and optimism. We can all play a part in making our work better, not just for ourselves but the whole world.